In August and early September, the stars of Bee Heaven Farm are the shiny green Donnie avocados grown to almost football size. Stroll through the grove even this late in summer and you’ll see many, both on the branches and littering the ground below. Tropical Fruit Agent Jeff Wasielewski and Margie Pikarsky open up an avocado. 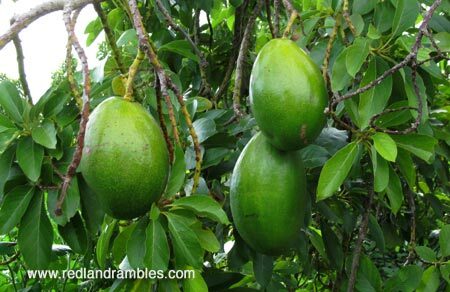 Margie’s pride and joy is the grove of over 90 avocado trees, which she herself planted back in 1996. She and Wasielewski stopped at one tree where she picked up a windfall avocado and handed it to him. It looked ready to eat, so he pulled pruning snips from a case on his belt, and cut open the fruit. He’s a tall, easy going man with a ready smile and 18 years of tropical fruit experience, and 21 years of horticulture in South Florida. You might already know him from lectures, articles and videos he made for Fairchild Tropical Botanic Garden, where he was the Educational Outreach Specialist. He’s developed keen senses and loads of experience when it comes to tropical fruit and plants. All it took was one taste and he said the avocado was a day away from being perfectly ripe. Further down the row of trees, he noticed a dead branch, which Margie snapped off. “Be careful,” he warned. 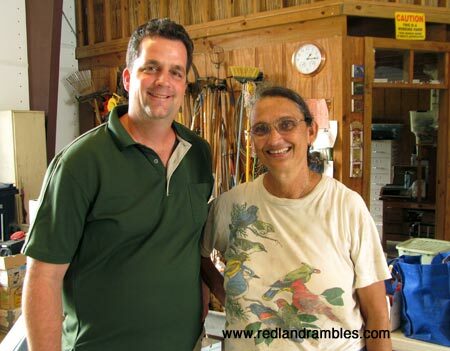 “A dead branch like that can attract other beetles now suspected of carrying laurel wilt.” Margie explained that she removes dead branches from the trees as soon as she finds them, and trims the trees every year. So far her grove looks healthy, but laurel wilt disease remains a lurking concern. Laurel wilt is a dangerous avocado disease that appeared in Miami-Dade County a few years ago. It is spread by the red bay ambrosia beetle, which is tinier than a grain of rice. Wasielewski explained that the beetle burrows into healthy avocados and other trees in the laurel family. “It cultivates a fungus that eventually kills the tree branch by branch by disrupting its vascular system. Signs of the disease are quick branch dieback or tiny holes and sawdust towers where the beetles enter the tree. The tree will die very quickly if infected. Commercial growers are advised to quickly and completely remove the tree and its roots. The removed tree should be burned in place, out of fear of spreading infested wood to other groves and trees. Root removal is necessary because the disease may spread from tree to tree through root grafts,” he told me in an email. As Tropical Fruit Agent, one of Wasielewski’s goals is to inform avocado growers of new research on combating laurel wilt. “It’s important that I am on the cutting edge of what is going on in the tropical fruit world,” he said. University of Florida has done tests, and complied a list of pesticides that will kill the ambrosia beetle. Unfortunately, none of them can be used in an organic grove. Local organic growers are pressuring the scientists to test substances approved for use in organic production. Margie expressed her frustration to Wasielewski at the current lack of effective organic options. He said he would keep her informed as to new research into alternative treatments. “I want growers to have options as far as doing things in an environmentally friendly way. I let them know their options and the value of each option. Growers are then free to make a choice on how they want to proceed, but only if they are armed with new knowledge and multiple options,” he told me in an email. For now, it’s wait and see how bad laurel wilt gets in Redland, and how quickly research can come up with solutions that all growers can use. Wasielewski is an important addition to the Extension office during a critical time for tropical fruit growers. As for Bee Heaven Farm, over the years Margie has accumulated a wide variety of other tropical fruit trees, tucked away here and there among the vegetable beds. 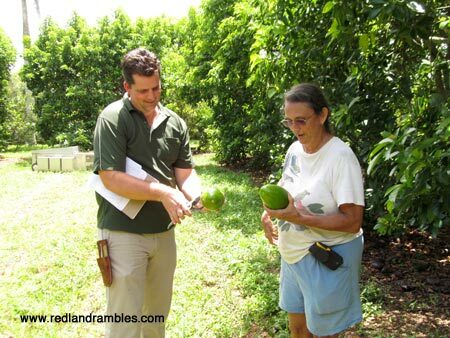 Sapodilla, carambola, longan, mango, and bananas are planted in various spots on her five acre farm. If her avocado trees have to go, she’ll plant different fruit trees and more vegetables, she once told me. But until then, she and other growers will put up a fight to save their groves. Got a question about tropical fruit? Contact Jeff Wasielewski at 305-248-3311, ext. 227 or email at jwasielewski@ufl.edu .